Dr. Brian P. Jacob is an American Board Certified minimally invasive general and bariatric surgeon. He operates at Mount Sinai Medical Center and at Midtown Surgery Center in New York City. Dr. Jacob performs a variety of surgical procedures, but has a special interest in treating the diseases of hernia, groin pain, abdominal pain, and obesity. Dr. Jacob is active in the American College of Surgeons (ACS) serving as the Chair of its social media subcommittee and in the Society of Gastrointestinal and Endoscopic Surgeons (SAGES) where he is on the Board of Governors. He also serves on the Board of Governors of the Americas Hernia Society (AHS). He has been selected by The New York Times Magazine and by Castle Connolly Medical Ltd. for New York Magazine as a Top Doctor for 4 consecutive years (2012 - 2015). He is a proud member of the Worldwide Registry. 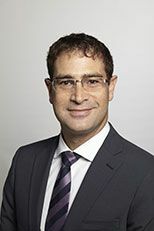 In addition to operating, Dr. Jacob is the author and co-author of numerous book chapters and articles in peer-reviewed journals on topics that include robotic surgery, hernia, groin pain, and obesity, as well as the first series of single incision laparoscopic TEP inguinal hernia repairs in the USA. He recently co-edited The SAGES Manual on Hernia Repair, a 600 page textbook about hernias. He also co-wrote The SAGES Manual of Groin Pain which was published in 2016. A full list of his publications can be found here. In his spare time, he is an avid NY Giants football fan and an entrepreneur. He is the inventor of a patent on a novel medical device and the founder of a new start-up company called IncLinx that was recently acquired by angelMD.com. In an effort of help optimize patient outcomes after hernia repair, in 2012 Dr. Jacob launched the International Hernia Collaboration, a private group of hernia surgeons and hernia industry partners. Through transparent dialogue, preoperative, intraoperative, and postoperative decision making can be optimized, allowing all surgeons from around the world to collaborate together on behalf of their patients. He is a member of the voluntary faculty at The Mount Sinai Medical Center in NYC where he is an Associate Clinical Professor of Surgery. He was a founding board trustee member of the New York State Chapter of the American Society of Metabolic and Bariatric Surgery (ASMBS) and served as its treasurer for 2 years. He remains active in the national ASMBS society serving on the committee for patient safety. Feel free to contact Dr. Jacob at his office at 212-879-6677 or by following him on twitter @nychernia. Ask Dr. Jacob a question by sending an email using the form below.